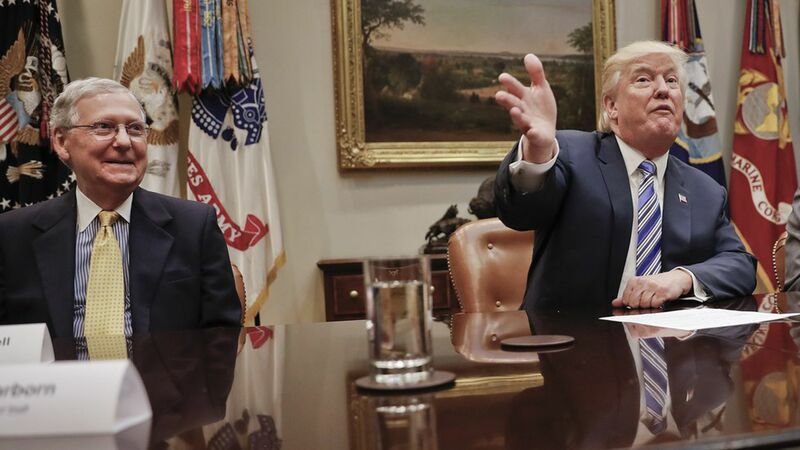 President Trump tweeted this morning: "I requested that Mitch M & Paul R tie the Debt Ceiling legislation into the popular V.A. Bill (which just passed) for easy approval. They didn't do it so now we have a big deal with Dems holding them up (as usual) on Debt Ceiling approval. Could have been so easy-now a mess!" Why this matters: Trump is pre-blaming Republican leaders, Senate Majority Leader Mitch McConnell and House Speaker Paul Ryan, for the debt ceiling headache that's coming in September. And he's piling on them at a moment when his relationships with Republicans on Capitol Hill are at an all-time low. What Trump is referring to in his tweet: The VA-debt ceiling plan was an idea that floated around congressional circles shortly before the August break. Sources with knowledge of the matter tell me the White House legislative affairs team lobbied congressional leaders to attach a debt ceiling raise to the bill to fund the Department of Veterans Affairs. The thinking behind the idea: The White House figured it'd be a way to make September slightly less painful for Republicans. Instead of having to deal with funding the government and raising the debt ceiling, they'd have taken the debt ceiling issue off their plate by getting it through Congress on a popular bill that both Democrats and Republicans support. Why it failed: It fell apart due largely to timing and bandwidth. House GOP leaders put the VA bill on the floor on the Monday of their last week before the August break. The bill failed because Democrats objected to some of the policies contained in it. GOP leadership then needed to come up with a new deal, and squeezed it through the House on Friday, and left for the August break. The Senate, which had already discussed the idea in June, was consumed by an imploding healthcare bill. Behind-the-scenes: It wasn't just congressional leaders who didn't leap into action on the White House's idea. Some conservative members, who don't want to vote to raise the debt limit without getting some major spending cuts in return, didn't like it. Their response, according to an administration source familiar with the conversations, was "What? You're going to make us vote against veterans?"